Forget what you know about the WiFi and Internet, especially the part where you have to pay to access it. A game changing project called the Outernet by the Media Development Investment Fund, aims to bring free, unlimited and universal web access to the entire planet. If successful, outernet will be a major step forward in making us a truly joined-up global society. Imagine total connectivity, anywhere in the world, free censorship and free of charge. The potential benefits to mankind and our planet are enormous. 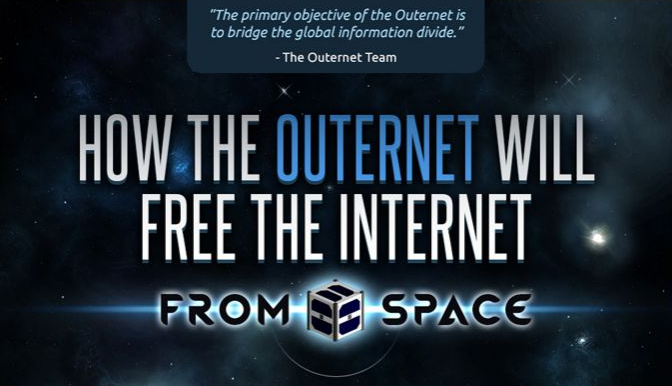 An infographic from whoishostingthis team titled "How the Outernet will free the Internet from space" explains that Outernet will use a network of miniature satellites floating in space to broadcast data such as news, information, education and entertainment back to earth. While digital content will be transmitted from earth into space with tiny Cubesat satellites distributing the data in a continuous loop to mobile devices, antennas and satellite dishes. This visual breaks down the what, how, where, why, who, when of the Outernet.